To say the end was unexpected hardly would be true. For months there had been signs of age taking its toll; in past weeks there had been increasing restlessness; discontented murmurings; howls in the night. Still, that it would come so suddenly took me by surprise. 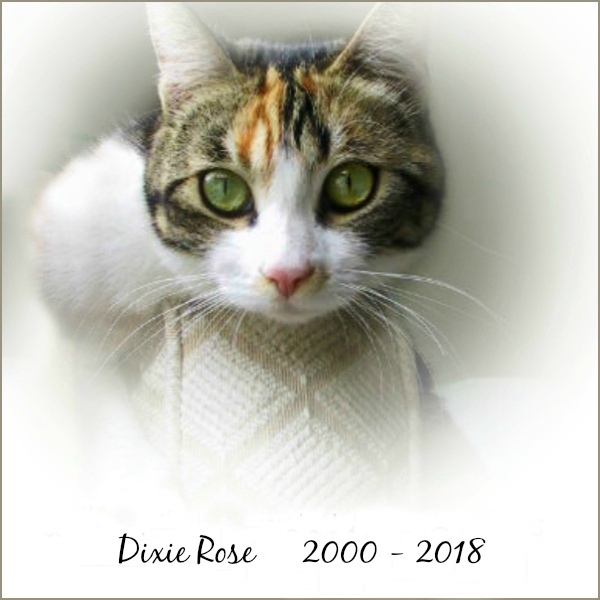 After our usual morning routine — I always drank my first cup of coffee while brushing her into a state of purring contentment — I arrived home in early afternoon to find Dixie Rose staggering and in pain, suffering from partial paralysis. Within half an hour we were in her veterinarian’s examining room. Still unable to walk, totally non-responsive to the probings of the vet, and showing no signs of her usual combativeness, she seemed exhausted. Possible causes were outlined, but certainty would require testing, or more invasive procedures. In the meantime, she would continue to suffer. The decision, of course, was mine; it was more than a little comfort that the veterinarian agreed with the wisdom of the decision. After eighteen years of healthy and happy companionship, it was time to let her go. Laugh at the antlers if you must, but laugh at your peril. That business-like look in the eyes of my beautiful calico is very real. Dixie Rose (short for Dixie-Rose-Center-of-the-Universe-and-Queen-of-all-She-Surveys) loves Christmas, and she intends to be ready when it arrives. I don’t advise standing in her way. Dixie arrived on my doorstep fourteen years ago: an unloved, four-month-old stray who became my first pet. I did receive a small, painted turtle as a child, but it met an unfortunate end. A well-meant birthday puppy lasted only a few hours. Tiny but exceedingly enthusiastic, the black Cocker Spaniel terrified me, and soon was sent packing by disconsolate adults. If it weren’t for the Alamo, bluebonnets, longhorn steers, and Willie Nelson, I’ve no doubt the lowly, nine-banded armadillo would trundle to the top of the Texas totems list. It’s a strange one, this tank-like creature named for nine parallel scutes neatly tucked between two larger shoulder and hip scutes. It’s also the only armadillo species in North America, having migrated fairly recently from south of the Rio Grande.